After all, an empty wallet is not fit for a prince. Selling items is the quickest way to earn gil! What do you use gil for? This is how you make a living in the world of Eos. I will show you how to earn gil (money) in Final Fantasy XV. You’ll see that earning gil in this game is not done by defeating enemies in battle. Instead, we can earn gil through finding treasure and participating in hunting quests. 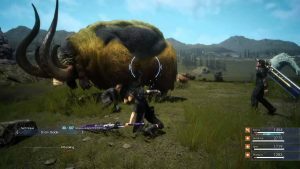 You cannot get gil even if you do a lot of combat in Final Fantasy XV. However, when you defeat enemies, they drop items such as “claw of clearing” or “scorpion of thorns.” Most of these items are basically unusable. These items can be sold at a price ranging from 100 gil to 100000 gil. Therefore, you can easily obtain gil by selling items that your enemies drop. Some of these treasures can also be used as a material to refine powerful magic by combining with magic refining elements. More than that, they could also be used to create profitable magic that can be used for earning experience points. By finishing hunting quests, you can obtain gil as a reward. You can get a large amount of money ranging from 1,000 to 3,000 gil in the early stage just by finishing a quest in the area. You will not be bothered by money if you do your best to finish quests. Even if the quest is replayed, you can earn gil, although you will earn less than your first time. You can earn gil efficiently by defeating enemies while replaying hunting quests. Money has a variety of uses in Eos. You’ll spend money when you buy weapons and items, fast travelling, staying at inns, and eating food. You should earn a lot of money so that you’ll have a comfortable adventure. You ought to use the money for the party’s accommodations. If you stay at the camp, the status will reflect the experience value as it is, but if you stay at the hotel, it will be twice the experience value and it will be reflected in the status. Since you should quickly raise your party’s level, you should also stay in good lodgings.